You can help children prepare for kindergarten by volunteering and/or donating supplies for United Way Literacy Kits! United Way is preparing for the 2018-19 school year with its annual Literacy Kit Kickoff during tax free weekend, August 3-5. Literacy and early learning are critical to ensuring kids are ready for kindergarten and reading at grade-level by third grade. Help students reach these important Steps to Success by volunteering, donating supplies or hosting your own literacy kit drive. Bring together friends, neighbors or colleagues and host a literacy kit drive to maximize your efforts. Click here for ideas and tools to help get started. Join us August 3-5 to collect supplies for our literacy kits. Click below to sign up for a shift at one of our four locations! Volunteers will help collect, sort and count donated school supplies at partnering Walmart locations. 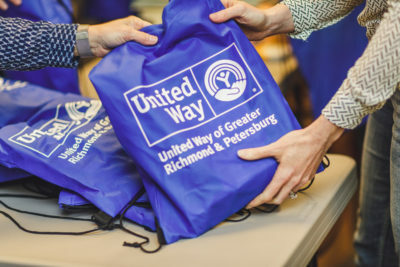 With the help of volunteers at this event, United Way will raise awareness of the importance of early literacy and continue the effort to ensure all kindergarteners have what they need to start school. You can easily donate supplies to help this effort. Come to one of the three locations during the times we will be there and pick out some of the supplies needed for the Literacy Kits.